AKA jurisprudence: how the courts and, from a wider perspective, our regulatory tribunals — the Ontario Municipal Board and the Conservation Review Board — have interpreted the Act and its regulations. Not complaining, but there hasn’t been much courtroom, let alone courtroom drama, associated with the OHA. For a statute that’s been around for 40 years there are remarkably few court decisions. Probably this is because the legislation was, until Bill 60 came along, relatively weak, so property owners (the most likely challengers) didn’t see much at stake. Also that the two tribunals involved have, as intended, borne the brunt of what disputes there have been — and have handled these competently, with few errors in law that would open the door to review by the courts. 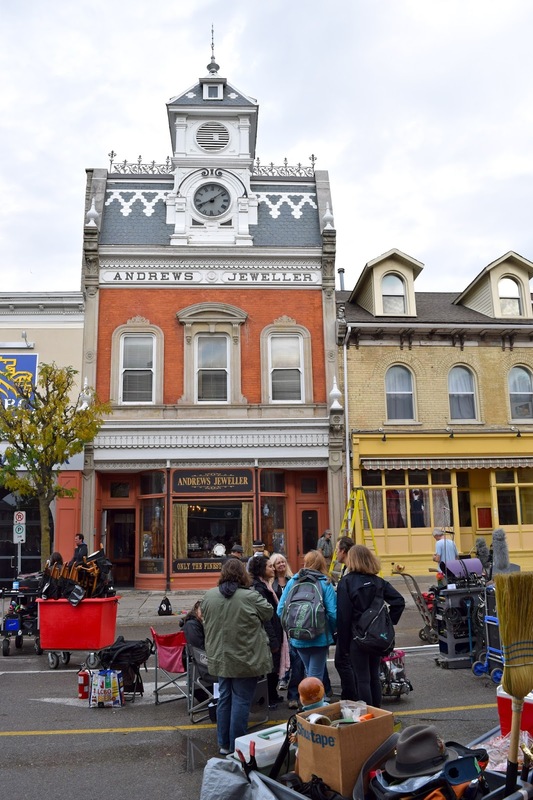 The case concerns the iconic Andrews Jeweller building in downtown St. Marys. The 1884 building is in the middle of a heritage conservation district but is also individually designated — outside and in. And it’s the “in” that led to the dispute here. The designation by-law, from 2008, covers the building exterior and “all of the original interior features” from 1884. While these are not spelled out, the by-law has a schedule attached with photos of the interior, and the photos, not unlike the historical one reproduced here (although minus the jewellery! ), show a wall clock, walnut cabinets and counters, and mirrors. The owners argued that these features were chattels or personal property, not real property, and that their designation was invalid, since only “real property” including “all buildings and structures thereon” can be designated under the Act. The back story here is that the out-of-town owners have been trying to sell the building for years and are convinced that the restrictions on the truly gorgeous interior are scaring off buyers. [Note 3] After attempting in vain to get the Town to remove the designation of the interior, they sought redress from a higher power. So the court was faced with the question — were the clock, cabinets, etc. personal property (not designatable), or were they fixtures, part of the real property (designatable)? In a different lexicon, moveables or immoveables? Now the wall clock in the Andrews Jeweller building could simply be lifted off its hook, and this had been done for cleaning purposes. The counters were just sitting on the floor. Removal of the cabinets and mirrors would be more difficult but could be done without damage. The evidence establishes that they were designed and installed for the express purpose of attracting customers and selling jewellery through an enhancement of the realty. 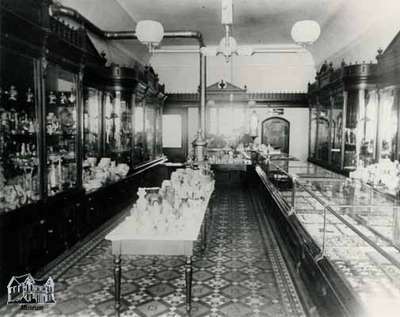 The wall clock, cabinets and counters were purposefully designed and built into the store for a specific purpose. They were used for that purpose and never moved again in over 100 years. And so the owners’ suit miscarried. A sensible result. It seems the test is not (the simpler) one of how easy a heritage element can be removed, but (the harder) one of intention and purpose of its installation. I’ll leave you to ponder the implications for other old stores and their counters and shelves, for old churches and their alters and pews, for old town halls with their wallclocks and furniture… et cetera. Does it matter if these things weren’t "original" but added later? Note 1: In drafting Bill 60 the culture ministry sought a legal opinion on whether proposed tougher demolition controls would hold up and was advised to include “no compensation” provisions (OHA section 68.3); but compliance with the Charter was not considered. The lawyer successfully arguing the Town's case was Eileen P.K. Costello, of the Toronto firm of Aird & Berlin. Note: The owners appealed the decision but the Court of Appeal dismissed the appeal on a technicality in June 2016. Note 3: The designation certainly didn't scare off CBC's Murdoch Mysteries when it came to town a year ago to shoot two episodes of their series, one involving a gang of female jewel thieves. 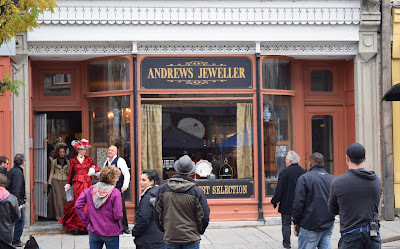 The Andrews building, both inside and out, played... a jewellery store.